3Way handicap - What is it? 3Way handicap or European handicap is a bit difficult for reckoning. We would try to disclose this topic the way you’d never have problems with it again. Literally, 3Way handicap represents three options. In arbitrage betting, that are three outcomes: 1, X or 2. This line supposes the initial score of the competition given by the bookie. The point is that this kind of bet does not imply any returns. First bet "1" - straight win of Team1 with initial score 0-2 equals to negative fractional handicap H1 (-2.5) (Remember! In case of fractional handicap, a draw is impossible). Second bet "X" - draw with initial score 0-2. Third bet "2" - straight win of Team2 with initial score 0-2 = H2 (+1.5). 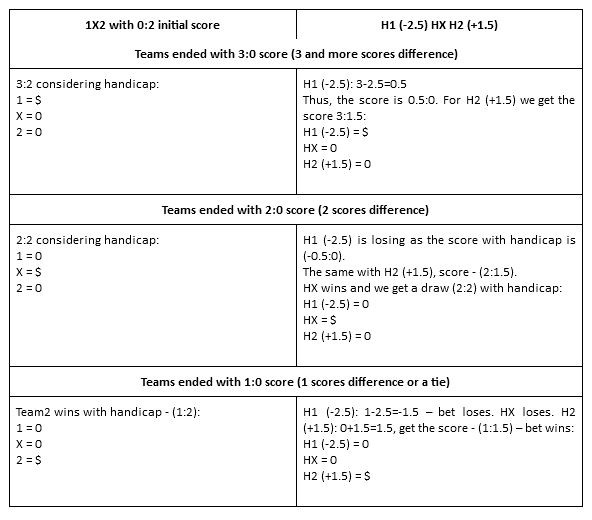 Different initial score for 3Way handicap assumes different equivalent handicap wagers. Therefore, the 1X2 line would be equal to H1 (-1.5) HX H2 (+0.5) with initial score 0-1. In case of 0-3, the 1X2 line equals to H1 (-3.5) HX H2 (+2.5). To sum up, 3Way handicap does not presuppose any returns. Consequently, the bet may only win or lose. Be very attentive betting this kind of lines.